Thanks Slappy for posting all this info. Now I'm going to have get one of these too try. I'm about 15lbs heavier than you so will see what that does to performance. I have lots of joint pain too the point where soft ride is way more important to me than crisp performance. That's pretty cool. Certainly peeks my curiosity to try it out. All the Catch Surf / Wave Bandit line require normal surf wax. I wax it up before every session as I find that it sheds the wax more than a traditional surfboard. Soft board technology has come a long way. I was working with a team to make the Catch Surf boards back in 2006 and they are a great board but they do have their disadvantages. No real fins.....no real solid structure and they do eventually warp. But the experience of riding on a board that is softer is unique. All the advantages you mentioned are true. A softer board is more animate and feels like it is more 'alive'. True high performance soft boards which are custom and have been tested on the North Shore for well over 10 years now. EPS and S glass under the skin. Rails have an industrial strength softer foam just under the skin. After riding one it is very hard to go back to an exoskeleton board which can knock you out cold....Kelly Slater said was the closest he was to death in the water when his board knocked him out in France. Sending this one to James Ropner next week -- hoping to get some good feedback. The traction on the board is licensed by Surfco of Hawaii. Wax Mat traction. And yes that is Mike Hynson of the original Endless Summer movie---we are talking to him about making a Hynson model next year. On an intersting side note.....the exoskeleton (glass over foam) was invented by Bob Simmons. 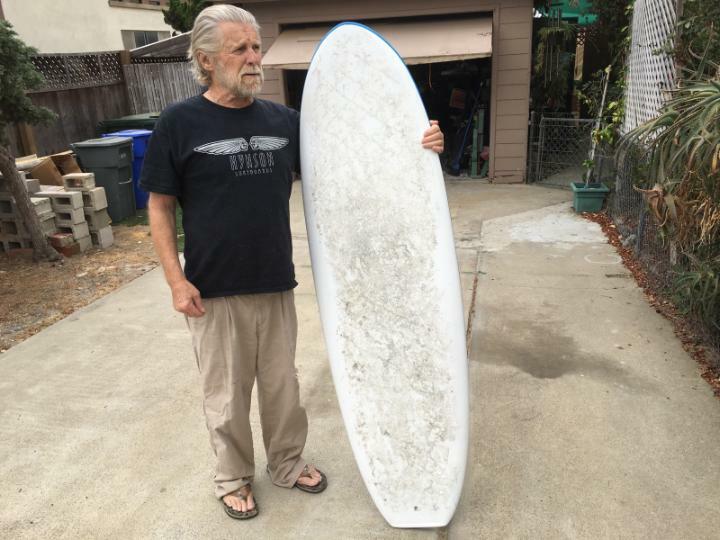 Any ocean surfer knows of Bob. But does everyone know that he is known to have died to to a blow to his head by his own board? Robert Wilson Simmons, age 35 -- the "Father of the Modern Surfboard" -- died surfing on September 26, 1954. How he died, exactly is unknown. Greg Noll guessed that Simmons "Got slapped on the head by his own board and that was it." According to Greg Noll, it wasn't that big a day -- certainly not beyond Simmons' skills. "The irony of it is that it was only a six-or-eight-foot day," wrote Noll. "That's the way it always goes. For the most part, it's not the big waves that get a guy. It's always some quirky thing." From emergency room data near a popular surf spot. 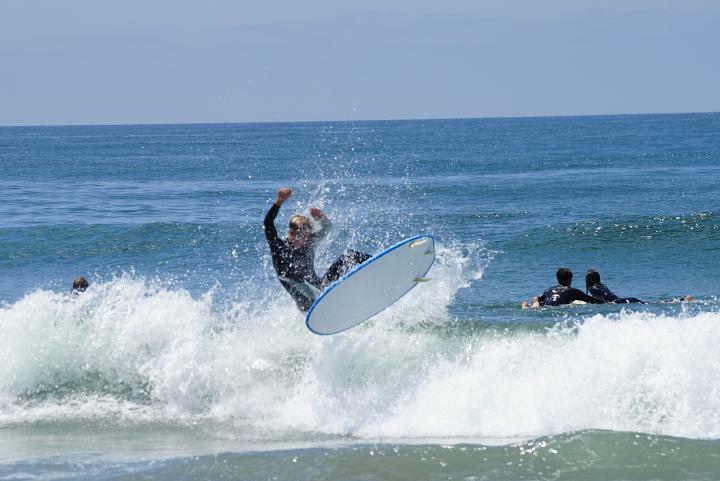 350 admissions to emergency departments for surf-related accidents were recorded. 65% of surfers injured were experienced surfers and 35% were beginners (44% of whom were injured during a surfing lesson). 59% of accidents occurred when the surfer made contact with his own board. All this technology and 'fashion' gets in the way of function. We have our aim set to change all that. The link is in the first post. 149.99 a board for the 4�10�. Only one color left /mint til the end of November then a new shipment of all the colors you will wants arrives in time for Christmas ! Not trying to hijack his thread. Drop me an email at cushsurfboards@gmail.com and I will send you specs. and www.silencersurfboards.com is our old site. I had the Wave Bandit Performer 4-10 out in 40 knots today and it performed stellar as usual. My worry about the board getting away from me downwind after falls turned out to be fine. It flies a bit easier than my epoxy boards but still catches the water and rests for 2-4 sec between wave troughs. Also landed flat and hard twice from 15 feet and no sign of buckling still. Also while anything will stick to your feet in 40 knots I found that the Wave Bandit would stick well enough to allow me to air off of onshore wind waves and land back on the face of the wave. Until now I had always had to air over the wave and land well on the other side. I picked up a Stump 5-0 quad during the black Friday sale for $200. Haven't ridden it yet but I thought I would post the weight. 2# penalty for the extra 2� seems egregious. Is the outline blown up hugely or something? It's an extra 2" in both dimensions, 2.5 in width actually. Also double stringer vs. triple stringer. out of stock on Amazon at the moment. Catch Surf didn't know when they would be back at Amazon. They said they will have new stock in February. The Rock-It Chub also looks pretty interesting and a similar style. Rock-It seems like a real surf company not just reseller of generic Chinese foamies. They didn't know if anyone has tried kiting with them but were interested in any feedback. CORRECTION--the board is 7lbs. The shipping weight (with carton) is 9lbs. Thanks for asking! At 7 lbs that's a full 1.4 lbs heavier than the Performer 4-10. That's a 25% heavier board. I think it could still be great to kite with, but not in the same class as the Performer 4-10 for aerial's. that stump 5' board was fun on that bend wave! I just weighed Chub 6lb 1oz. Rails are quite sharp and much, much stiffer than i expected. Hopefully get to play with it in a couple of weeks.